On Thursday 27th September some 40 members and guests travelled by coach to the National Memorial Arboretum in Staffordshire. Highlights from the RBL Chipping Norton trip to the National Memorial Arboretum On the Army Commando Memorial we found the name of Cyril Barrett from the town who died in the Dieppe raid on 19th August 1942 aged 22. One of the most poignant memorials was a piece of railway track from the infamous Burma Railway. At least two men from Chipping Norton were POWs of the Japanese and endured the hardship and cruelty working on the railway: Arthur Edgington of 35th Light Anti-Aircraft Regiment and Leslie Gilbert of 135th Field Regiment, both Royal Artillery. Leslie Gilbert died on the Japanese ship Hofuku Maru on 21st September 1944 whilst being transported to Formosa, as did Bombardier Bernard Austen of the 95th Anti-Tank Regiment from Tadmarton. Some of the many memorials we visited, a great day out was had by alland a return trip planned for next summer. Our thanks to The Armed Forces Trust of Chipping Norton for subsidising the coach. 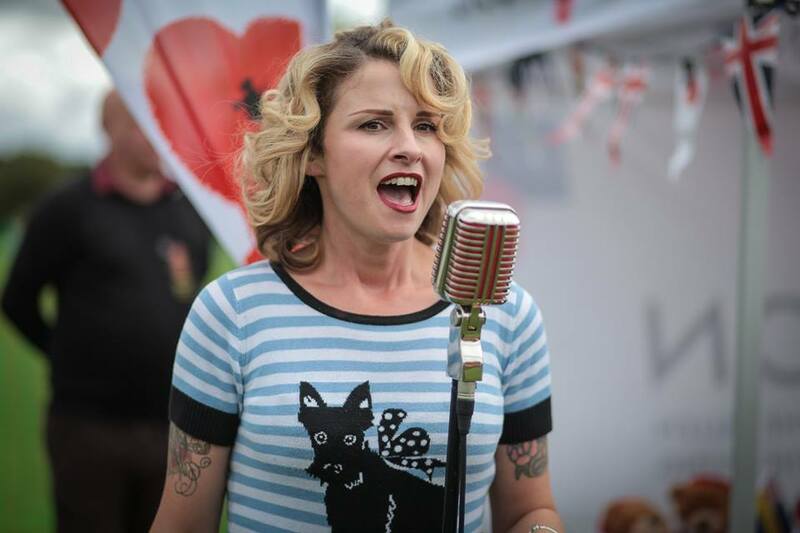 On Friday 5th May we were entertained by songbird Lula May at the Crown and Cushion, with about 50 members and guests enjoying songs from the 1940s. 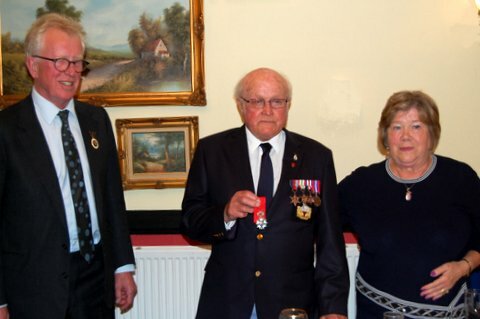 On Friday 18th August we held a reception at the Crown and Cushion Hotel to present our member Mr Reg Williams with the Legion d' Honneur, awarded to him by the French for his part in the liberation of France. Present were Reg's wife Ruth and members of their family, Mr David Astor Deputy Lieutenant, Lynda Atkins RBL Oxfordshire County Chairman, Deputy Mayor Don Davidson, the Reverend Victor Story, members of Chipping Norton Royal British Legion and their guests and villagers from Little Compton, where the Williams live. Lance Corporal Williams of the 2nd Battalion, the Gloucestershire Regiment landed on Gold Beach on 6th June 1944, D-Day. They fought their way off the beach and took the town of Bayeux the following day. Reg was wounded in the Battle of the Falaise Pocket in August 1944 and evacuated back to England and hospitalised for 4 months. When he recovered he was sent to Vienna with the Allied commission in Austria. 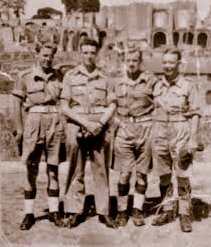 Reg is pictured on the left below, whilst in Rome. 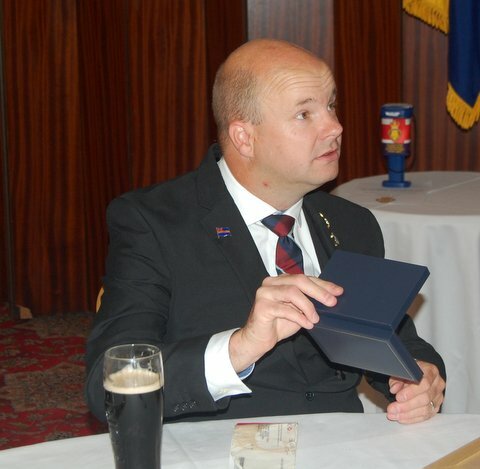 After our President Linda Maia e Silva welcomed our guests our Chairman Steve Kingsford recited the Ode for the Fallen and the Reverend Victor Sturdy paid tribute to to the work of the Royal British Legion before saying a prayer for those who died in conflict. 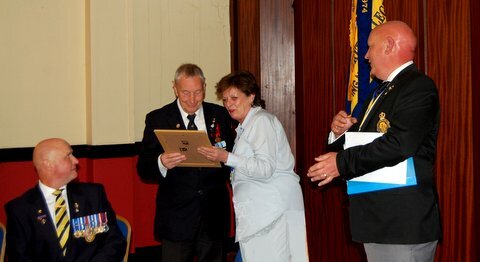 We made two presentations before the main event, firstly County Chairman Lynda Atkins presented Mr Pat Nolan with a certificate and badges for 45 years service to the Poppy Appeal. 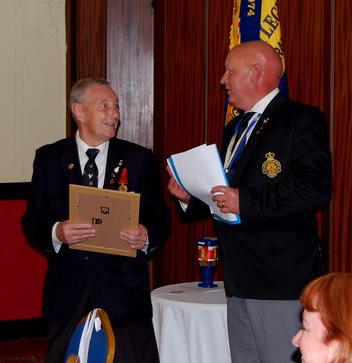 Our President then presented Mr Phil Nicks, a member of our committee, with an certificate of appreciation and Branch Life Membership for all of his work and support over the years. 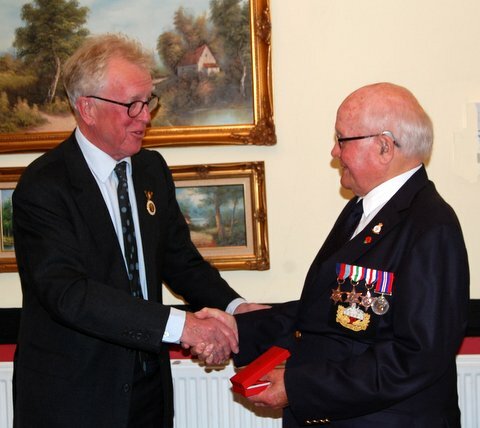 The Chairman paid tribute to Reg, recalling his service in the Battle of Normandy and reading letters from the Duke of Kent, Queens Colonel to the 1st Battalion, The Rifles which absorbed the Gloucesters a few years ago, and from local MP, Mr Robert Courts. 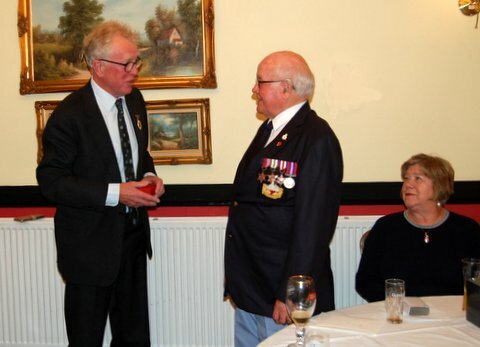 He then asked Mr David Astor, Deputy Lord Lieutenant of Oxfordshire to present Reg his medal, which the branch had had court mounted. 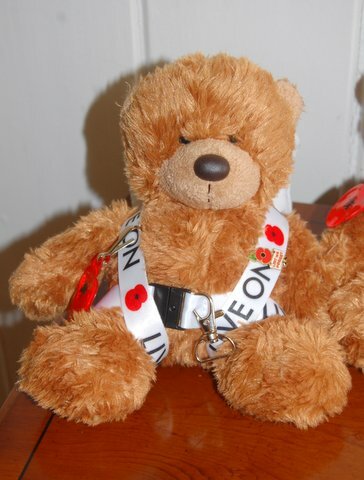 Flowers were presented to Mrs Ruth Williams and souvenir "Ted Devils" parachutist Teddy Bears were given to Reg's three great grandchildren. 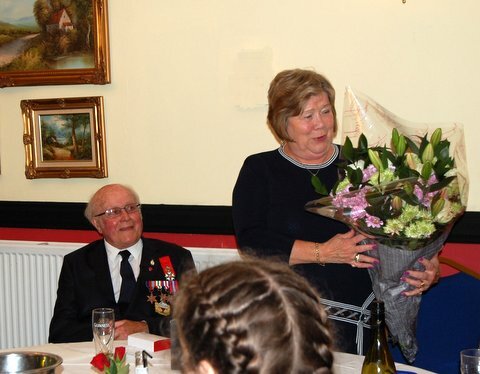 Ruth then presented our President and owner of the Crown and Cushion with flowers and a pewter tankard to our Chairman for organising the event. A buffet was then served and we were entertained by jazz singer Kim Osmond, accompanied by Martin Pickett on piano. 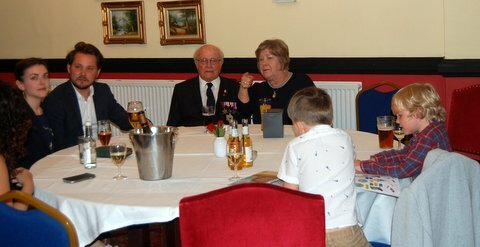 The evening was a great success and it was wonderful that Reg's family had travelled from afar to be with him. It was a privilege and an honour to be able to organise this reception for him. More photos from the evening below. On Saturday 30th September we had a stand at the YIMBY festival at Chipping Norton Cricket Club, which we shared with the Royal Air Force Association. Sunshine, which had been intermittent, was provided in bucketfuls by our guest Tintine La Voix who sang for us in the afternoon, with a repertoire from the 40's, 50's and 60's. Our thanks to her and we look forward to seeing her again. 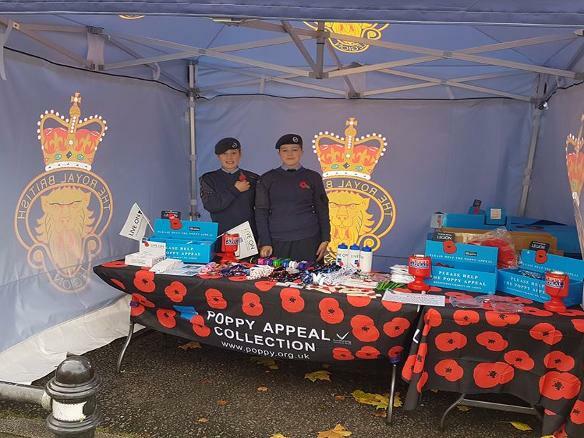 Our Poppy Appeal in Chipping Norton kicked off on 23rd October when our two youth members Leila Atkins and Annalise Kingsford took part in the Swanbourne Endeavour 5km mud run. Between them they raised £250 for the Appeal.Well done girls. On Saturday 4th November we were out in force in the town centre in our brand new eye-catching gazebo. We were assisted by cadets from 136 Squadron Chipping Norton Air Training Corps. Their enthusiasm and impeccable behaviour endeared them to us all and we are very proud to be associated with them. They helped us raise over £1,500 in the town on Saturday. Our collectors were once again able to enjoy free beverages courtesy of Café Nero, our thanks to them. 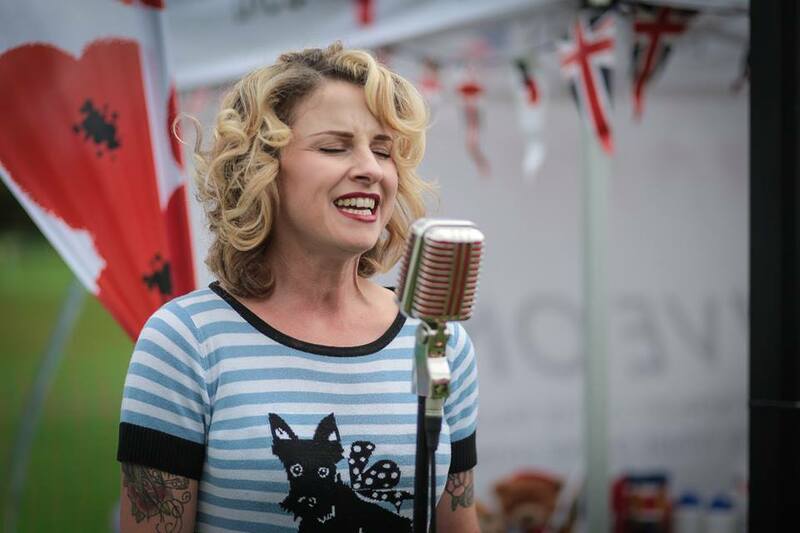 In the afternoon we were entertained by our Legion sweetheart Lula May, who performed songs from the 1940s on the town hall steps. A bucket collection while she was singing netted £238, thank you Lula. As Armistice Day fell on a Saturday this year, we held a special service for the year 6 children from the Holy Trinity Primary School. The children laid crosses, one for each man from the Second World War on the war memorial they have been studying the war this term. They then said prayers and poems they had written themselves and laid a wreath on behalf of the school. It was a very moving event and we hope to have a special schools Remembrance service again next year and include the town’s other schools if possible. We gathered at the War Memorial at 1045 for our annual Armistice Day service on Saturday 11th. 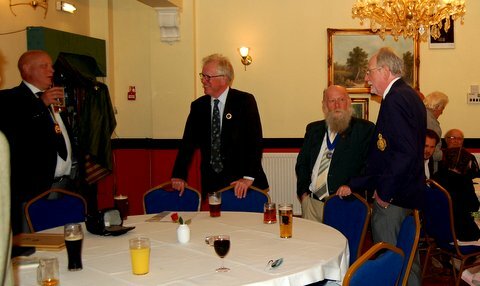 It was a very good turnout and the Chairman welcomed everyone and related the stories of two of those who died 100 years ago in 1917. Charles Joines was the oldest man on the war memorial, he died on the home front whilst his son Edward died at the Third Battle of Ypres. Prayers were then said by Father Tony Joyce and our President Linda Maia e Silva recited the ode, her first public performance. After our President had recited the Kohima Epitaph and thanked everyone for coming we buzzed Over Norton to carry out an act of Remembrance in front of their War Memorial. This was a nice little touch, despite the Chairman trying to do the service in reverse order. Then back to our HQ for a much needed pint of their Daleside Poppy Ale ( Well I needed it). Then we made our annual pilgrimage to the beautiful setting of Little Rissington. The Mayor and Linda came along for the first time as did our buglers Kim and Emma from the Shires Youth Band, kindly extending their stay with us. There we met the Vicar, Christopher Etherton and our Air cadets. We were also privileged to meet family members of Sergeant Baz Barwood of the RAF who had just laid a cross on his grave. Sergeant Barwood died in Iraq in 2008 and was known to both Peter Clarke and Tjark Andrews. 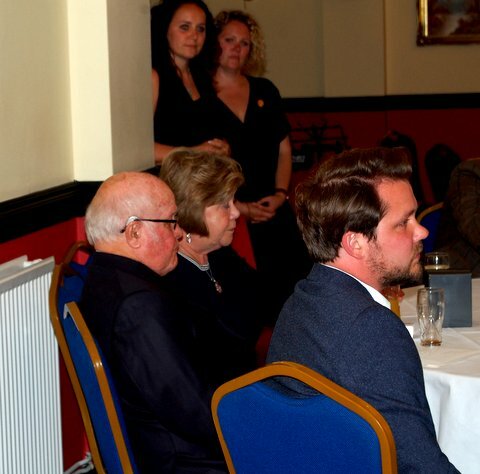 His family stayed on to witness our act of Remembrance and were touched by what we did. After the Vicar had welcomed us the cadets laid crosses on the graves on the airmen who had died in and around Chipping Norton and on the grave of one of their own Cadet 1st Class Kenny Stone who had died on a flight experience sortie, aged only 16. After this it was back to Chipping Norton to carry on with our Poppy collecting duties. However with the stand being manned by Gill and Tracey, below, assisted by Gareth we felt we would be better off drinking Poppy Ale in the Crown and Cushion as a proportion of every pint drunk goes to the Appeal. Remembrance Sunday dawned bright but cold and our parade grows bigger each year. We marched down to the church, pausing to lay a wreath on the 1942 air crash memorial. The service was moving and the church packed. An addition to this years service was the singing of “No Man’s Land” by Chipping Norton School student and member of “The Accidentals” brass ensemble, Arianne Bennett, accompanied by Chris Brown on the piano. This was a beautiful rendition of a very poignant song about a visit to a World War One graveyard, and we thank them both. We marched back to the town hall where the Deputy Lieutenant, the Mayor and other dignitaries took the salute. Having been told there would not be a police presence on the parade we were surprised to see several officers on duty. They had in fact given up their day off to help us, unpaid, and we are tremendously grateful to them. We also thank all those who acted as marshals on the day. We faced the Town Hall steps to be addressed by Linda, our President on her first Remembrance Sunday. In an interesting speech she reflected on the 100th Anniversary of Women at War and on the work the Legion carries out for our Armed Service Community past, present and future. The Mayor, Mike Tysoe spoke of the events in 1917 and made the point that Remembrance was not just about the two World Wars, but also later later conflicts, citing our chance meeting with the family of Baz Barwood. 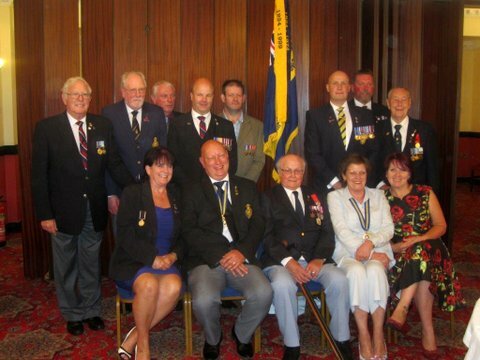 After the Remembrance Sunday parade we adjourned to the Town Hall for refreshments. 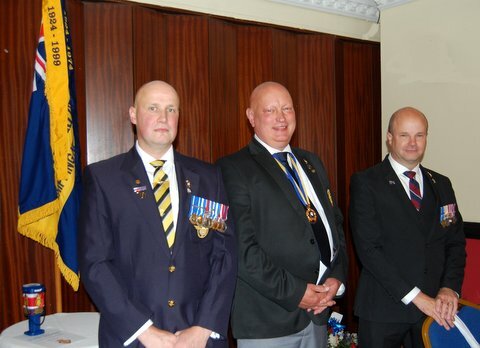 Three presentation were made, firstly to our Deputy Lord Lieutenant David Astor, who is retiring from his post. 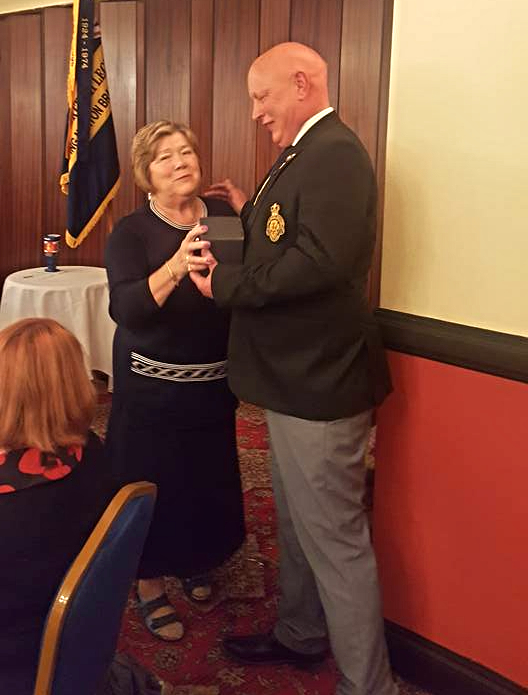 David has shown us unstinting support in all the various commemorations we have undertaken and we presented him with an engraved tankard in appreciation of his support. 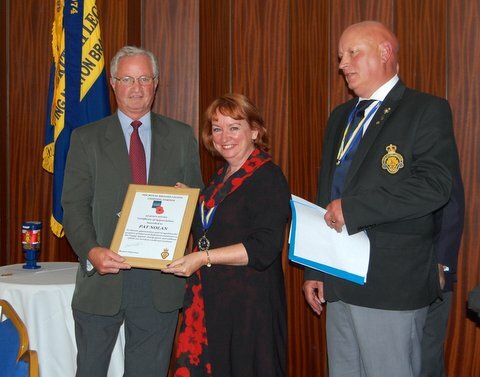 Our next presentation was to our past President, now vice President Neville Edwards. 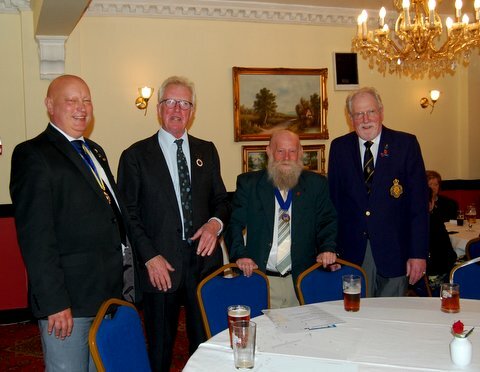 Neville has served on our committee since the 1970s and has embodied our motto of service before self. 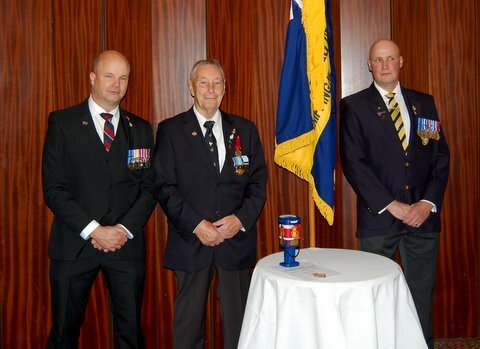 We applied for one of the highest honours a branch member can be given, the gold badge. This was ratified by the National Chairman of the RBL and we were delighted to present Neville with this well deserved honour. Our last presentation was to Cecily Mauder who has been selling poppies for 25 years and arranging the flowers on the pedestal in the church for longer. 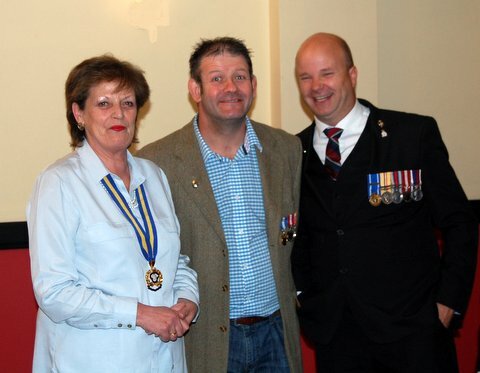 We presented her with 25 year Poppy badges to mark this wonderful service to our cause.